The earliest-known ancestor of modern primates, Teilhardina's close relatives would eventually give rise to today's monkeys, apes and humans. But one of the persistent mysteries about this distant cousin of ours is where it originated. Teilhardina (ty-hahr-DEE'-nuh) species quickly spread across the forests of Asia, Europe and North America, a range unparalleled by all other primates except humans. But where did its journey begin? New research shows that Teilhardina brandti, a species found in Wyoming, is as old or older than its Asian and European relatives, upending the prevailing hypothesis that Teilhardina first appeared in China. Teilhardina's origins, however, remain a riddle. "The scientific conclusion is 'We just don't know,'" said Paul Morse, the study's lead author and a recent University of Florida doctoral graduate. "While the fossils we've found potentially overturn past hypotheses of where Teilhardina came from and where it migrated, they definitely don't offer a clearer scenario." What is clear, Morse said, is that T. brandti had a wide variety of features, some of which are as primitive as those found in Teilhardina asiatica, its Asian cousin, previously thought to be the oldest species in the genus. To make this determination, Morse studied 163 teeth and jaws in the most comprehensive analysis of T. brandti to date. Teeth contain a treasure-trove of information and often preserve better than bone, thanks to their tough enamel. They can reveal clues about an animal's evolutionary past, its size, diet and age as an individual and in geological time. Primate teeth have particularly distinct structures that are immediately recognizable to the trained eye, said Jonathan Bloch, study co-author and curator of vertebrate paleontology at the Florida Museum of Natural History. "Identifying differences between primate teeth is not so different from a biker recognizing that a Harley is different from a scooter or an art critic evaluating whether an image was created by Picasso or Banksy," he said. "In detail, they are very different from each other in specific, predictable ways." While Teilhardina bones are very rare in the fossil record, its teeth are more plentiful—if you know how to find them. Bloch's team of paleontologists, Morse included, have spent years combing the surface of Wyoming's Bighorn Basin on hands and knees and then packing out 50-pound bags of soil to a river to screen wash. The remaining bits of bones and teeth—which can be smaller than a flea—are examined under a microscope back at the museum. 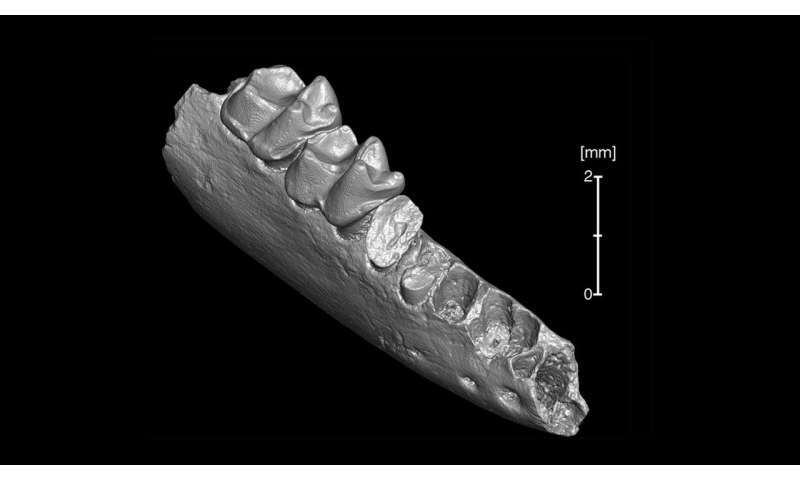 This painstaking search has built up the dental record of T. brandti from a single molar—used to first describe the species in 1993—to hundreds of teeth, providing a broad look at the primate's population-level variation. Still, Morse and Bloch were unprepared for the peculiar variation exhibited by specimen UF 333700, a jagged piece of jaw with T. brandti teeth. "Jon and I started arguing about the alveoli—empty tooth sockets—and how they didn't look right at all," said Morse, now a postdoctoral researcher at Duke University. "By the end of the day, we realized that specimen completely overturned both the species definition of T. asiatica and part of the rationale for why it is the oldest Teilhardina species." Studies based on a small number of teeth simply missed the diversity in Teilhardina's physical characteristics, Morse said. 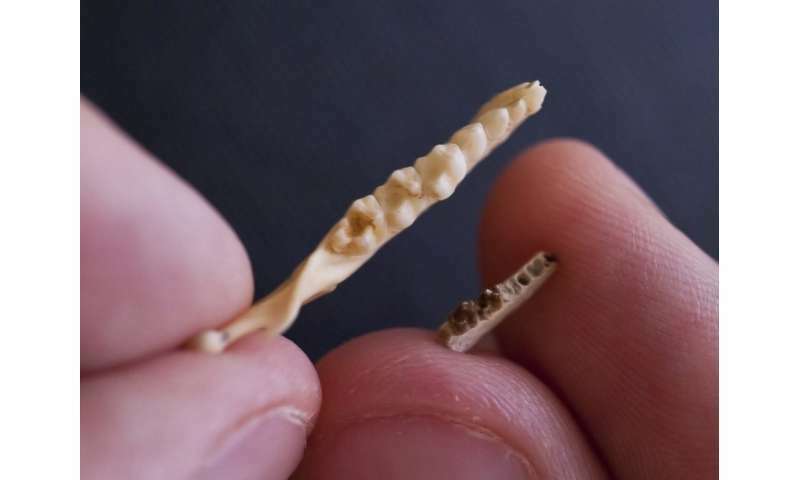 "There's likely a tremendous amount of variation in the fossil record, but it's extremely difficult to capture and measure when you have a small sample size," he said. "That's one of the reasons collecting additional fossils is so important." The analysis also reshuffled the Teilhardina family tree, reducing the number of described species from nine to six and reclassifying two species as members of a new genus, Bownomomys, named for prominent vertebrate paleontologist Thomas Bown. But the precise ages of Teilhardina species are still impossible to pinpoint and may remain that way. Teilhardina appeared during the geological equivalent of a flash in the pan, a brief 200,000-year period known as the Paleocene-Eocene Thermal Maximum, or PETM. This era was characterized by a massive injection of carbon into the Earth's atmosphere, which sent global temperatures soaring. Sea levels surged by 220 feet, ecosystems were overhauled and the waters at the North Pole warmed to 74 degrees. Scientists can use the distinct carbon signature of the PETM to locate this period in the rock record, and carbon isotopes in teeth can also be used to identify fossil animals from the era. But among Teilhardina fossil sites across the globe, only Wyoming has the uninterrupted, neatly demarcated layers of rock that allow paleontologists to hone in on more precise dates. "The humblest statement would be to say that these species are essentially equivalent in age," Bloch said. "Determining which came earlier in the PETM probably surpasses the level of resolution we have in the rock record. But what we can say is that the only place where you can really establish where Teilhardina appears in this climate event with confidence is in the Bighorn Basin." As the Earth warmed, plants and animals expanded their ranges northward, returning south as temperatures cooled at the end of the PETM. "This dance of plants and animals with climate change happened over vast landscapes, with forests moving from the Gulf Coast to the Rocky Mountains in just a few thousand years," Bloch said. Teilhardina likely tracked the shifts in its forest habitats across the land bridges that then connected North America, Greenland and Eurasia, he said. "Teilhardina is not throwing its bag over its shoulder and walking," he said. "Its range is shifting from one generation to the next. Over 1,000 years, you get a lot of movement, and over 2,000-3,000 years, you could easily cover continental distances." While it was well-suited to Earth's hothouse environment, Teilhardina disappeared with the PETM, replaced by new and physically distinct primates. It's a sobering reminder of what can happen to species—including humans—during periods of swift climatic changes, Bloch said. "A changing planet has dramatic effects on biology, ecosystems and evolution. It's part of the process that has produced the diversity of life we see today and mass extinctions of life that have happened periodically in Earth's history," Bloch said. "One of the unexpected results of global warming 56 million years ago is that it marks the origin of the group that ultimately led to us. How we will fare under future warming scenarios is less certain." The findings were published in the Journal of Human Evolution. They do not know the history but they are absolutely, positively sure that it evolved. No question about it. Definitely. Totally. And it was about 60-55 million years ago, too, I might add. They just don't know. But it's a fact. Indisputably so. Fact. They know for sure that it wasn't created just 6000 years ago. That would be absurd. And allow a supernatural foot into the door. That is just not acceptable. Totally intolerable in fact. Never mind that the creature (or what is left of it) appears fully formed with absolutely no other evidence of transitional forms found, ever - which is of course why they "don't know". But it must have evolved. For sure. As sure as *all* the evidence makes us, very. It is the best evidenced fact we know of, with 10*2000 against two roots and - since no evolution would mean independent roots - (10^2000)^10^6 against no evolution. That is like asking for 10^10^10^7 universes to find that one atom you like, instead of all the rest that is in front of you. And even so fantastically unlikely, much better than the obviously empty bleating from a mind poisoned by erroneous ideas, you poor mind you. As sure as *all* the evidence makes us, very. It is the best evidenced fact we know of. Much better than empty bleating from a mind poisoned by erroneous ideas, you poor mind you. Well said. Sick of these religious loons polluting science 'discussions'. On another matter, I have good intelligence that Jack and the Beanstalk was based on an actual real occurrence. I can't reveal my sources at this stage, but they are reliable. Now, it so happens that I have acquired some pieces of the True Beanstalk! Just PM me if you want to buy one or more. A mere £1000 each. Guaranteed genuine. First come, first served.